My question for you: What are your thoughts on when an inspiration becomes creative theft? How do you use inspiration to then make something that's all your own? Episode 28: Call of Knitting Zombies. First of all, let me say that I've gotten a little education on Henry Ford and I think it's safe to say he was not into civil rights. Yikes. I'll talk about it briefly in Episode 29. I'd already filmed this before learning that. Yuck. Otherwise, I'm back on track with regular podcasting and it feels nice to have more conversation going between us. Also if you have kids around, don't watch the video after 1:11:32 . You can see a bit of my husband's Call of Duty game. It's gross. My Question for you: What are some older pattern books or patterns you've been meaning to knit from, but haven't yet? The saying: "It's better to eat the wrong food with the right attitude than the right food with the wrong attitude." This is where I record the eleventy-billionth knitting podcast. What are the most interesting DIY/ cheap hacks you've made? They don't have to be knitting related. 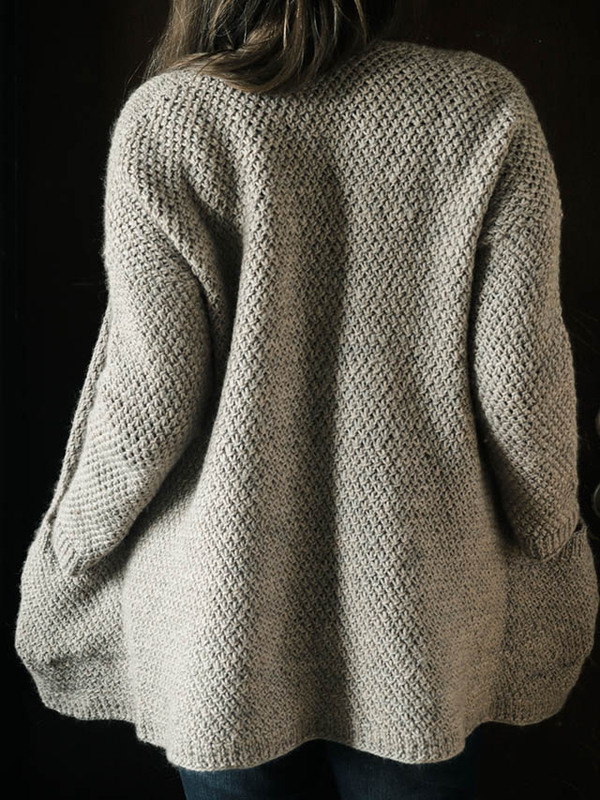 My question for you: 1) Would you wear am Aran oversized plaid sweater like mine? So should I bother writing out a pattern? 2) And what are some affordable super bulky yarns you use and what are you planning to knit in them? 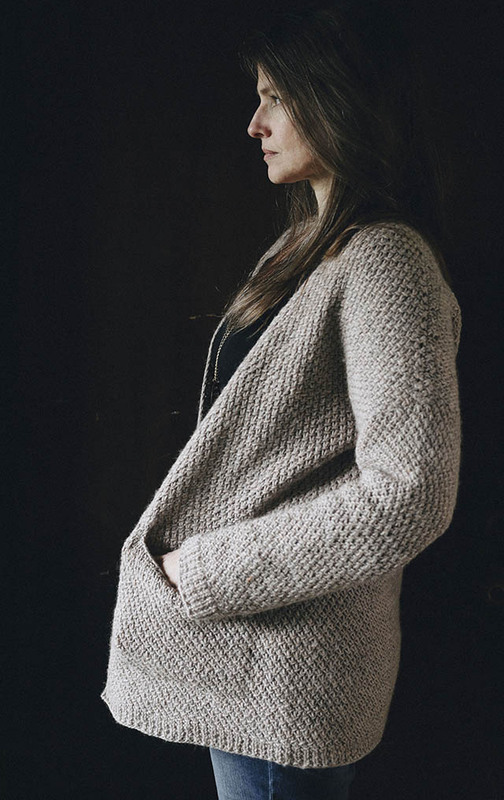 Kapsel, by Very Shannon, was such a pleasure to knit this winter. I am so happy I was able to test knit this one because it was finished before our cold weather left. And I have found that it goes with everything. I have to brag on Shannon for creating such a great throw-over-anything pattern. It is simple in shape, but complex enough to keep a knitter engaged. It's also the kind of knit that you can define a season by- like, "That was the year I knit Kapsel." This sweater was featured in my Fiberuary Challenge photos for "Knitfluencer you love" because Shannon is one of those. (It's good that it worked out that the pattern was released on the same day as that prompt.) 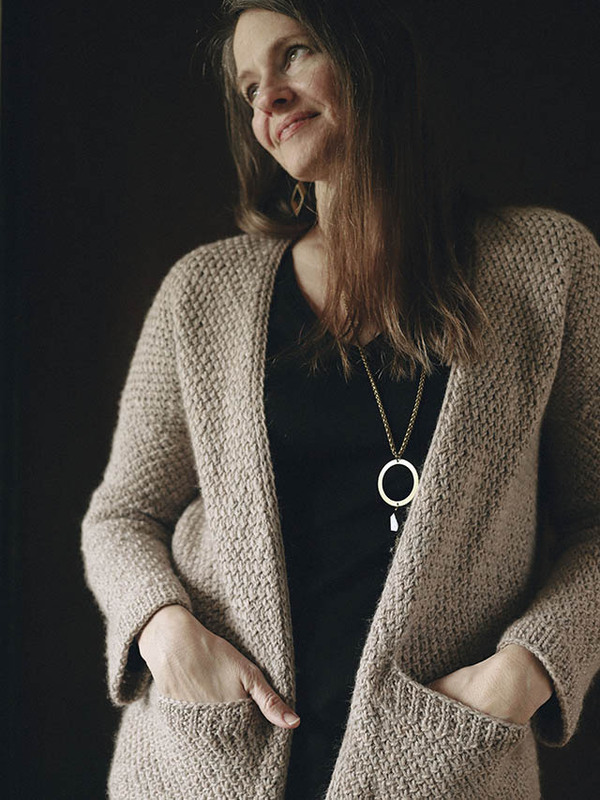 Knits like Kapsel have kept me coming back to Shannon's patterns over the years, but I think she has been an even bigger influence in my life by having such a warm, welcoming Ravelry group. Hers was one of the first Rav groups I joined and her Downton KAL was the first knit-along I remember entering (about 6 years ago, I think). 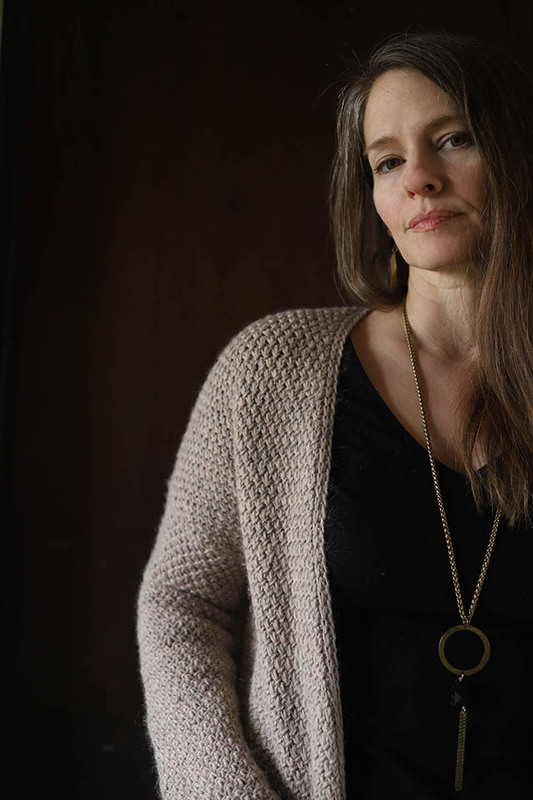 From that group I have met so many knitters around the world, many I feel confident that I could message, at the spur of the moment, and meet for coffee I were in their area. Suddenly knitting wasn't the solitary habit it had once been. My virtual world has opened up and I am grateful to those who provided the Ravelry groups that gave me this. So, I just have to say thank you, Shannon for being the gentle, sweet person you are and for providing a fun, loving group for all of us. Now for the knitting details: I used Patons Classic in the Natural Mix color with size US 4 needles. There are two distinct stitch patterns in their cardigan and I am amazed that my size 4s worked for both. I am also amazed that I kept an even tension thru the whole thing. Did I mention that I love it? Okay. Just checking. 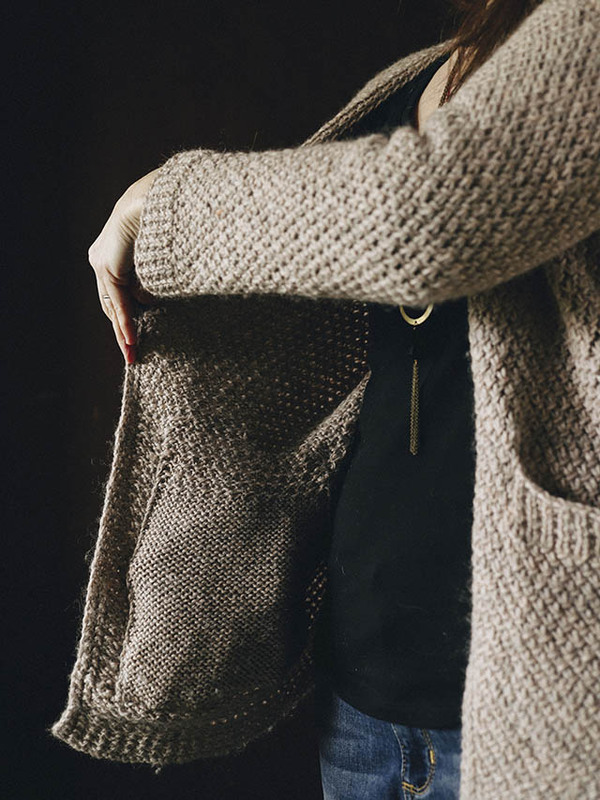 Here's some things I love about the pattern, besides the textural stitch that I already mentioned, is the pocket construction. There are helpful links that made it a very easy process. In my latest podcast episode I talk about affordable yarns I use and ways I make my knits more affordable. This was a very affordable knit and the yarn I chose holds up very well for me. I also think the Natural Mix color has an interesting quality where, depending on what angle you look at it, it can look tan or kind of pinkish- gray. 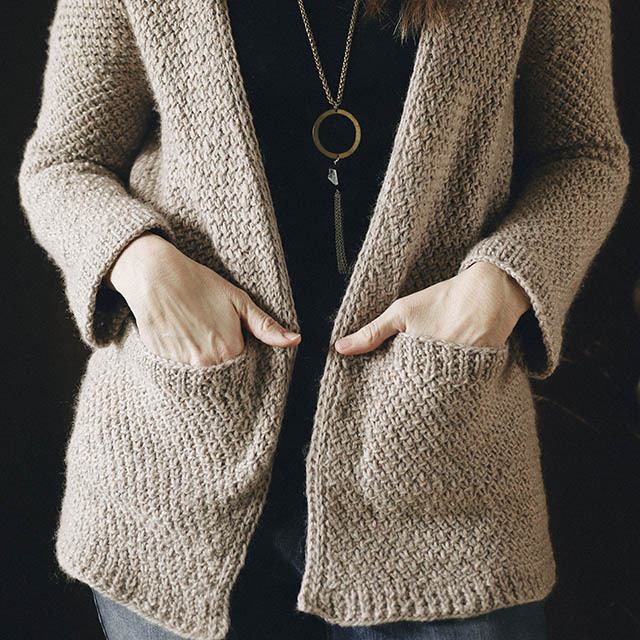 This kind of textured knit really looks best in a solid, to me, so you can't go wrong with a yarn like this. 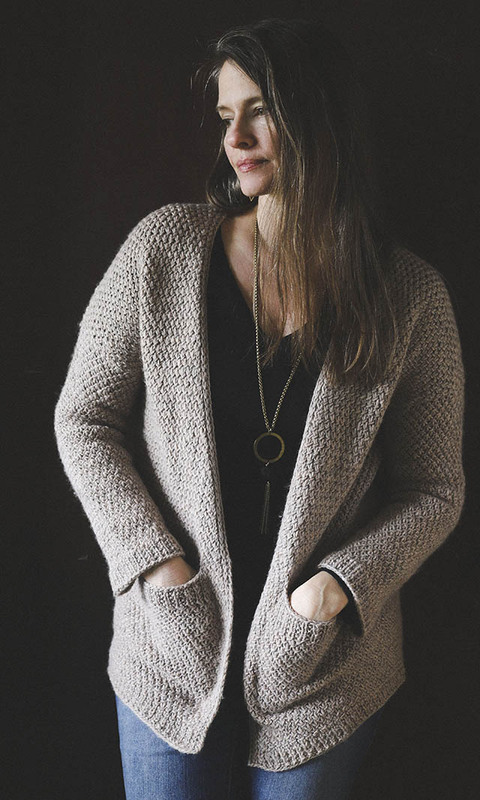 By the way Shannon shared a coupon code for this pattern in her instagram feed. And so it is even more doable. It will extend past February! My Question for you: What are your 2019 goals? How'd you do on yours from 2018? Proverbs 27: 17- Iron sharpens iron, Matthew 22:39- love your neighbor as yourself, James 5:16- admit your flaws, 1 Peter 4:8-11- we can forgive and encourage someone trying to change, 1Corinthians 12: 25-27- because we're equal, if one of us suffers all of us suffers, Galatians 6:2- Carry on another's burdens, Leviticus 19:15-18- speak up or you're guilty too! and don't bear grudges, Philippians 2: 3-16- value others above yourself, Ephesians 4: 2-6- be humble, gentle, and patient with love, Romans 12:3-13- review your actions soberly, be devoted to helping others. Luke 6:27-28- bless your enemies, Genesis 1: 26- we are all made in God's image, Revelation 7: 9-10- what heaven will look like.